Today – November 11 – is Martinmas. 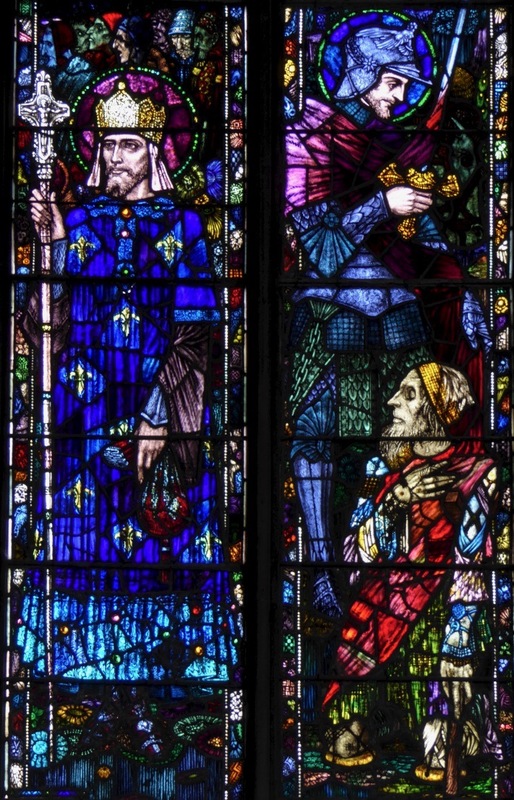 That’s the feast day of St Martin of Tours: the picture above is Harry Clarke’s representation of the city of Tours, which we can see in St Barrahane’s Church, Castletownshend, here in West Cork. St Martin was a saint of Hungarian origin who founded a monastery in Marmoutier, in north-eastern France in 372. As far as we know, he never visited Ireland, yet he is widely celebrated here… Why? Well, one reason could be that St Martin was the sister of St Patrick’s mother, Conchessa. Or, perhaps he was her uncle – we don’t have definitive records from that time, but we do have plenty of stories. The one everyone seems to know about St Martin is that he came across a naked beggar while travelling in the middle of winter. He immediately split his cloak in two and gave half to the beggar. That night he had a dream in which Jesus told him that it was he who had received the gift of the cloak from Martin. From then on Martin determined to spread Christianity wherever he went. 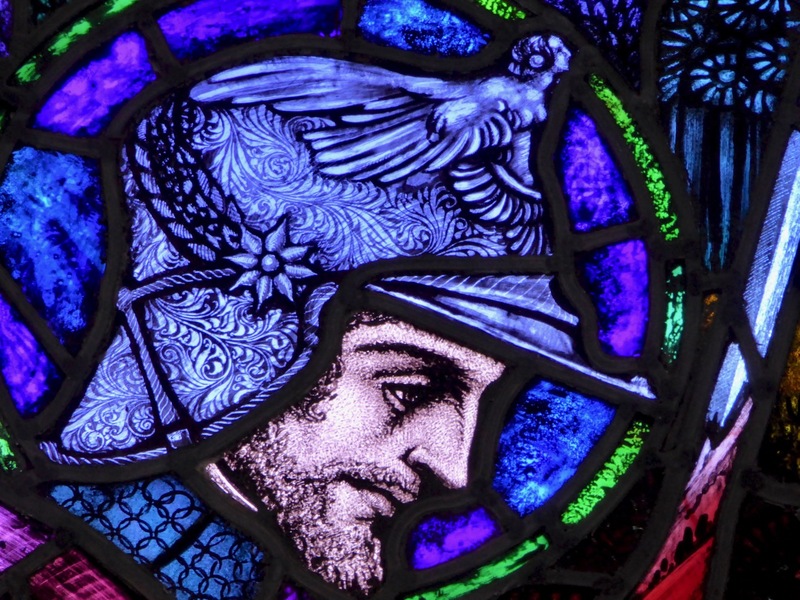 Here is St Martin, depicted in Harry Clarke’s Castletownshend window. Finola tells the full and fascinating story of this wonderful window here. He is depicted as a soldier, and is the patron saint of soldiers. Confusingly, he is also the patron saint of conscientious objectors! In fact, he was the first recorded conscientious objector as he became converted to Christianity while he was serving in the Roman Army. Because of his beliefs he refused to fight but – to prove he was not a coward – he was prepared to go into battle unarmed and stand between the opposing parties in the name of Jesus. Miraculously, on the eve of the battle an armistice was declared. Martin was given a discharge and was able to pursue his calling. 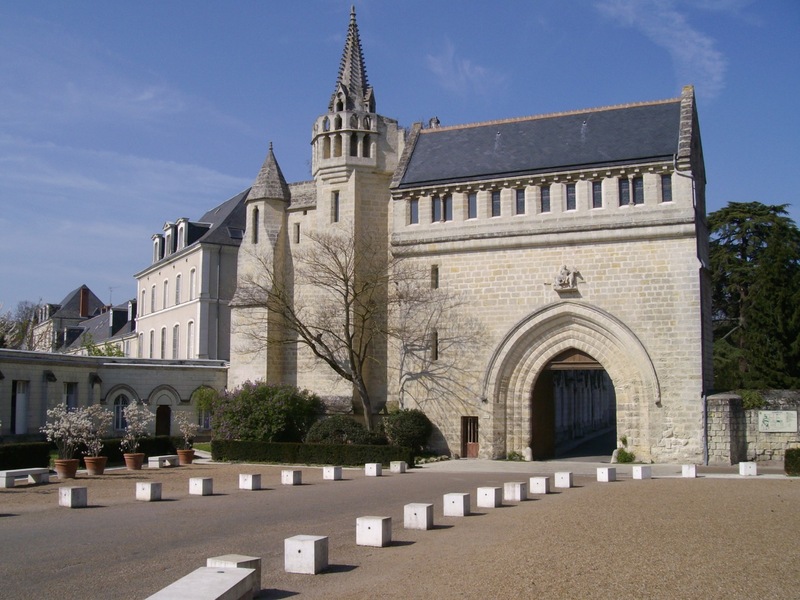 Eventually he was made Bishop of Tours and founded his Abbey across the River Loire. 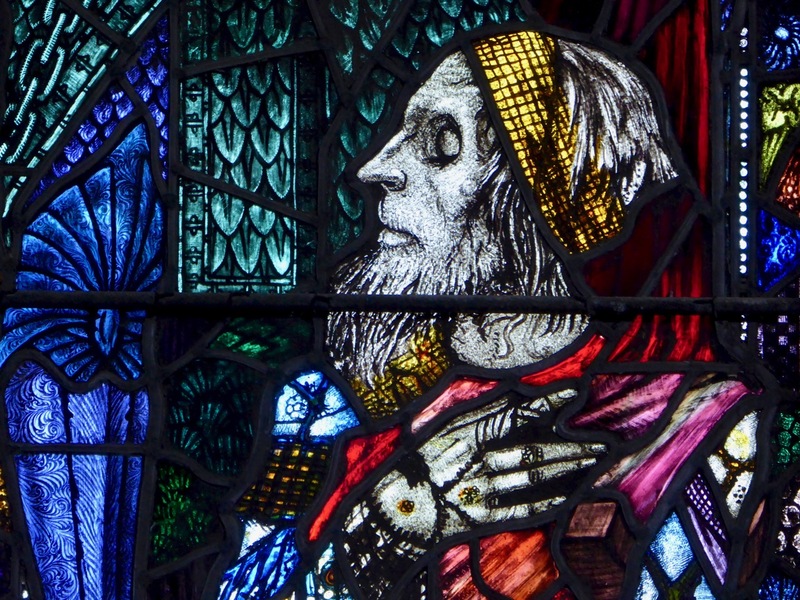 This is the beggar who received the gift of St Martin’s cloak – also from the Harry Clarke window. Here in Ireland there were once many customs associated with Martinmas. I set out some of these in a previous post a few years ago. For me, the most interesting is that no wheel should be turned on St Martin’s feast day. This is because the saint met his death by falling under a mill wheel. Below are two of ten 14th century frescoes from the San Martino Chapel in Assissi, setting out the stories of the saint: these depict his death and his funeral. 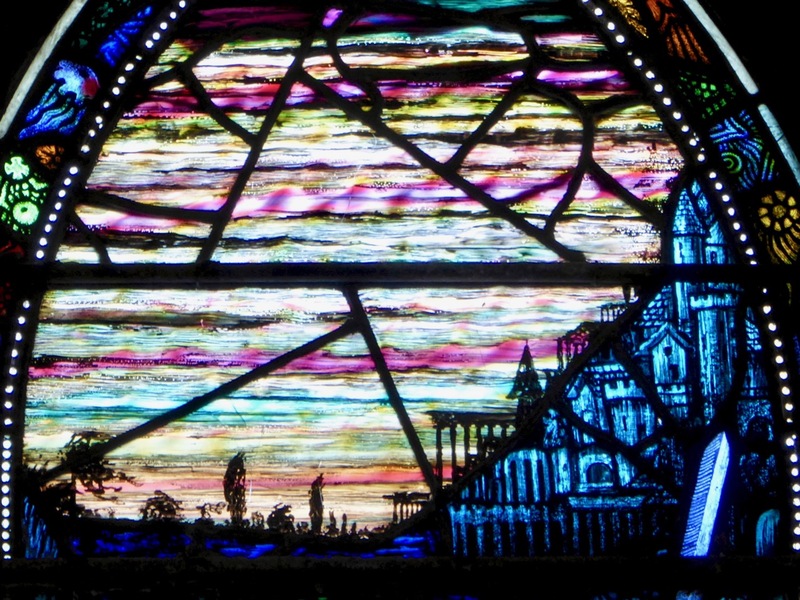 This entry was posted in Castletownshend, Folklore, Irish Art, Irish History, Irish Stained Glass, Medieval History, West Cork Blog and tagged Conchessa, Harry Clarke, Marmoutier Abbey, Martinmas, San Martino Chapel Assissi, St Barrahane's Church, St Martin of Tours, St Patrick. Bookmark the permalink. Great post, thanks as ever. Hope a steering wheel doesn’t count.. I missed that it was Martinmas today (and I did turn a wheel). Am I doomed? Enjoyed this post. Thank you, Amanda. I’m saying the phrase every waking hour!